Authentic,Acoustic ,Americana music from the Rocky Mountains.Kevin dooley is a songwriter and “songsmith” from Longmont Colorado with numerous CD’s and compilation projects. His unique “american celtic” style creates a vocal and guitar blend that is organic and powerful. Played main stage’s at Rocky Mountain Folks, Telluride Blues, Memphis in May, Fort Collins Celtic , Paonia Roots and The Colorado Irish Festival. Winner of the Crossroads Acoustic Blues Award at The Telluride Blues Festival and selected to play a main showcase at The SWRFA Conference in Austin, Texas.Has been seen lately travelling with George the wayward Road Monkey.Hopes to run a cafe/greenhouse/art gallery/live music venue whenever it is that he “grows up” !! kevin is also coming to Scotland in October supporting George Papavergeras at The Edinburgh Folk Club, 60 The Pleasance, Edinburgh Wednesday, October 16th at 8:00pm you should all go and sell the place out! call 0131 650 2458 for tickets. 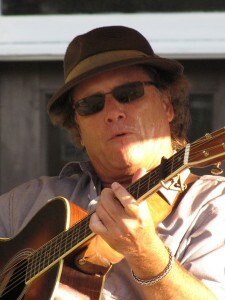 Kevin dooley gets compared to artist’s like:Van Morrison, John Hiatt, JJ Cale, Richard Thompson, James Taylor, Keb Mo, Greg Brown and David Bromberg. Over the years Dooley has opened shows for ledgends like; Leon Russell,Bo Diddley,Pine Top Perkins, and contemporary’s like,Chris Smither, Catie Curtis, LJ Booth, John Smith.Shared festival bills with Nanci Griffith, Marc Cohn, Los Lobos, John Gorka, Hot Tuna, Jim Hurst & Missy Raines, The North Mississippi All Stars, Jorma ,Gaelic Storm and more. His song “Roadmaster” was chosen for the first Colorado Blues Society “Best of Colorado” and, “Best of Boulder” Daily Camera. The “acoustic road warrior” on the singer-songwriter, blues/folk club circut for years. Kevin has been happy staying local/ regional for the last few years.On teaching staff at The Rocky Mountain Folks Festival “Song School” in Lyons. kevin released a CD on July 4th 2011called “Moonlight Highway” Has spent two months at #1 in Colorado and the Top 25 Nationally on the Americana Charts for Reverb Nation. Recorded high in the Rockies near Nederland Colorado. Todd Adelman at The Mountain House. Stellar musical guest’s ,Gurf Morlix ,John Magnie and Steve Amedee ,Casey Driessen,Eric Thorin,Diego Voglino,Jessie Burns,Bret Billings,Eric Drobny,The Kesslerette’s …!! comfy and live feel…..HOT! Available on Reverb Nation and on CDBaby,ITunes,Rhapsody,Amazon,Spotify…..Kevin teachs guitar and songwriting at Larrys Guitars and hosts a monthly,”Monday Songwriter Night” at Mojo Mama’s Music Academy.Always plays lots of gigs and brings live music to varied settings from street singing to large venues,coffeehouse to concert hall or small festival.Visits hospitals and nursing homes as well.Believing music should be woven into everyday life events and simply be a part of the fabric of things….. This entry was posted in coming to scotland by my voice. Bookmark the permalink.